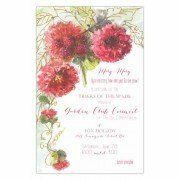 This beautiful invitation is perfect for any kind of shower or luncheon. White envelopes included.. 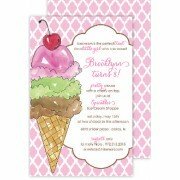 This 5.75" x 8.75" invitation is perfect for birthdays or ice cream themed events. White envelope.. This charming invitation in the shape of a tower of cupcakes is accented with.. This charming invitation in the shape of a puppy features detachable ears and is perfe.. 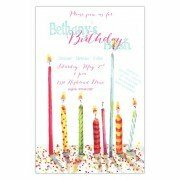 This 6" x 8" invitation is perfect for a baby or bridal shower, birthday party and more. Wh.. 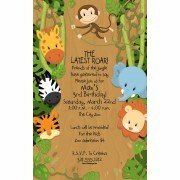 This 6" x 8" invitation is perfect for a child's birthday, jungle or safari themed party. White e.. 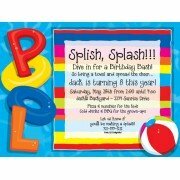 This invitation in the shape of ski tag is perfect for a birthday or ski themed party. White enve.. This charming invitation in the shape of a crown is embellished with a ribbon and rhinestones. En.. This two piece invitation features a teapot and saucer that are attached together with .. 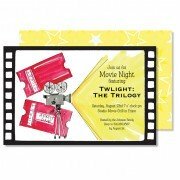 This charming invitation in the shape of a star is attached to a stick. A pink and gree.. This invitation in the shape of a nail polish bottle is embellished with a pink ribbon. Envelopes.. This invitation in the shape of a nail polish bottle features a floral cap and is embellish..